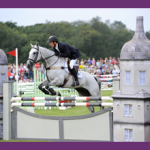 Set within the beautiful parklands of Burghley House, the three disciplines of the 3-day event are designed to be a complete test of horsemanship. The competition begins with the elegance and poise of Dressage on Thursday and Friday, then Saturday’s thrilling Cross Country phase is a test of courage and endurance. The Showjumping on Sunday brings the competition to a nail biting climax.